We both grew up with dogs and so it was never in any doubt that when we got married we would of course be getting a dog. The only problem we had was deciding on which breed would be right for us. When I was about 12 years old I had met a Bearded Collie who had jumped all over me and just about knocked me over and I thought he was just fantastic. We did a little investigating and our search took us to the market town of Malton where we found Liz and Mick Jay and the Talraz Bearded Collies. Quite remarkably they had a litter due and so in September 1988 we were married and our first Beardie, Murphy, came home too. And so here we are 31 years later ......... who'd have thought it. 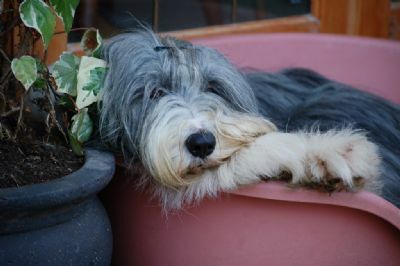 Bearded Collies have definately been the right breed for us and we could not imagine our home without them now.